We’ve all seen it by now, right? With this week’s blu-ray / digital release of The Force Awakens indicating that a reasonable time has elapsed, and since nobody else in the world has written anything online about Episode VII, I thought I would scratch out a few notions. 1. I liked it a lot. It’s a very good movie. I had the opportunity to revisit the series the week before I saw Episode VII, and I think The Force Awakens ranks only behind Empire Strikes Back and A New Hope for me now. 2. This is the kind of thing only a nerd like me thinks about, but I’m really glad Disney was mentioned solely in the closing credits. Kudos to them for having enough humility to realize that putting the customary, metaphorical mouse ears on everything would be jarring to longtime fans of the series. 3. I think my favorite character was Poe Dameron, but that might just be because we got the right “dose” of him. 4. I liked Finn, but he seemed to be scared of his own shadow. He’s definitely one of the more unsure heroes in the entire franchise. 5. On the flipside, I think Rey was a little TOO courageous—not to mention instantly great at everything. One review humorously analogized her to John Cena, which is surprisingly accurate. I think Rey’s talents needed to be toned down just a hair, and Finn’s courage needed to be bumped up just a bit. 6. Kylo Ren begins the movie as a major badass, using powers we’ve never seen before. However, beginning around the time he takes his mask off, he rapidly stumbles downhill. He shifts abruptly from ultra-dangerous bad guy to Andy Samberg’s emo little brother. He winds up seeming like a JV Vader at best. That might be a bit harsh, but the point is that the filmmakers will have a little rehabilitation to do on this character to make him seem like a legitimate threat again. That leads to my one real complaint about the movie. 7. Ren should have won the battle at the end. He loses to someone who (presumably) has no training, and even Finn holds his own. That all makes Ren seem like a hopeless underdog in VIII. The villain should never be the underdog. The idea here is that, if Rey can beat him in her first saber-fight ever, then, once she has actual training with Luke Skywalker, she should be able to beat him in about three seconds, logically speaking. If Luke had bested Vader at the end of Empire, their confrontation in Jedi would have been anticlimactic. I would have played VII with Ren winning, then had the ground open up, as it was in the movie, to keep them separate, then have her win the rematch in VIII or IX. It’s Booking 101. 7B. The good news is that Daisy Ridley, John Boyega, and Adam Driver were all highlights. Their abilities aren’t in doubt, which wasn’t always the case with a couple of key actors in the prequel trilogy. Ok, one key actor. 8. Another quibble with the movie was that it was glaringly obvious a couple of times that Abrams, not Kasdan, wrote a particular line. Two or three times (which isn’t much over the course of a two-hour movie), I was “bumped,” like when I heard Finn say, “I’ve had a really messed-up day.” That vernacular is a little too contemporary and slang-y. Again, minor complaint. 9. I’m glad someone had a bad feeling about this. 10. I’m glad nobody got a limb chopped off. 11. “Snoke” is a dumb name that sounds more like something out of Harry Potter’s world. 12. The movie had exactly the right balance between being a complete, self-contained story and naturally leaving a lot of open questions for the next instalment to answer. The criticisms form around two oddly opposite poles: One, the movie is far too derivative of Episode IV. Two, the movie is nothing like the George Lucas films. Obviously, these are mutually-exclusive criticisms. I do agree that there are many echoes of Episode IV here (Jakku = Tatooine, Han’s death = Obi-Wan’s death, Starkiller Base = Death Star, Rey = Luke, Snoke = Palpatine, and so on). I also agree that having another Death-Star-like superweapon means we’re nearly batting .500 for the series for Death-Star-centric episodes. My favorite criticism came courtesy of the “STARKILLER BASE IS SCIENTIFICALLY IMPOSSIBLE” guys. They do understand they’re watching a movie where people use laser swords, mind control, and telekinesis on a regular basis, right? Anyway, the creative choices in VII were a natural reaction to the heavy fire taken by the prequels (particularly the first two) for not including the things that made the original three films so great. Abrams smartly knew that he needed to hook both new fans and older fans who were perhaps a little skeptical of a new set of movies. The easiest way to do that was to appeal to nostalgia while introducing new elements. I am very confident that Episode VIII is going to be a stark departure from The Force Awakens. 14. Another quibble: Han Solo’s death scene was very odd, in the sense that both the First Order troops and Rey, Finn, and Chewie stop what they’re doing and just stand around and watch as Kylo Ren and Han talk it out on that perilous bridge thing. I don’t claim to be a military expert, but I’m pretty sure that’s NOT how battles work! 15. One more tiny complaint: The final shot was unnaturally long. I don’t think Luke would just stare at Rey for 30 seconds while she stood there with her arm extended, and I don’t think Rey would remain in that position for that long without saying anything. 16. This isn’t about the movie, per se, but I do worry about oversaturation. As much as I enjoyed Episode VII, I’m concerned that the litany of Star Wars films we’re about to get will fatigue casual fans, as has happened with me and the Marvel Cinematic Universe. Hell, I’ve still never seen Avengers 2 or Iron Man 3. By the time we get through Rogue One and the Han Solo and Boba Fett films (along with Episode VIII), will the appetite for even more films be as strong as it is now? Maybe, maybe not. 17. All in all, J. J. Abrams got Episode VII right. This was a very good movie, and a worthy kickstart for the series. There were a lot of ways that The Force Awakens could have been botched, but Disney, Abrams, Kasdan, and the strong cast managed to avoid all the major pitfalls. This entry was posted in Commentary, Movies, Reviews and tagged Adam Driver, Commentary, Daisy Ridley, Episode VII, Episode VIII, Finn, JJ Abrams, John Boyega, Kylo Ren, Lawrence Kasdan, Movies, Nerd Alert, Poe Dameron, Rey, Rogue One, Star Wars, The Force Awakens. Bookmark the permalink. Chewie’s mourning got me…now I look t my dog when I leave for work and feel even guiltier…. 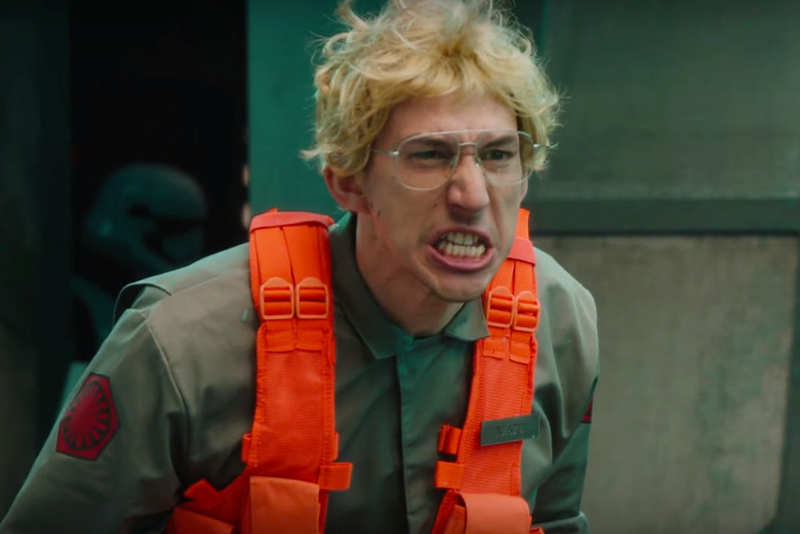 Kylo Ren is the best thing in the movie. Best character, best actor, best everything. !!!!!!! The fact he hasn’t an ” evil face” without the mask is a wonderful idea. A “normal” looking guy who can make orrible, devil thinghs. !! You didn’t understand this:: it means you didn’t understand the movie. You’re right. I didn’t understand this extremely complex Star Wars movie. Thanks for setting me straight!